O’Rourke’s going to answer questions about this, I assume, by stressing that he ran as a liberal in Texas last year despite the fact that the state’s red tilt gave him every incentive to double down on fiscal conservatism. That should be proof enough of his ideological commitment, just in case his recent support for the Green New Deal and universal health coverage hasn’t already reassured lefties that he’s one of them. What will sting about this line of attack, though, is that it reinforces a narrative about Beto that already exists, namely that he can’t be trusted to forcefully prosecute the progressive agenda if elected. It’s the Democratic version of Republican apprehension about Mitt Romney’s brand of “severe conservatism” circa 2012. 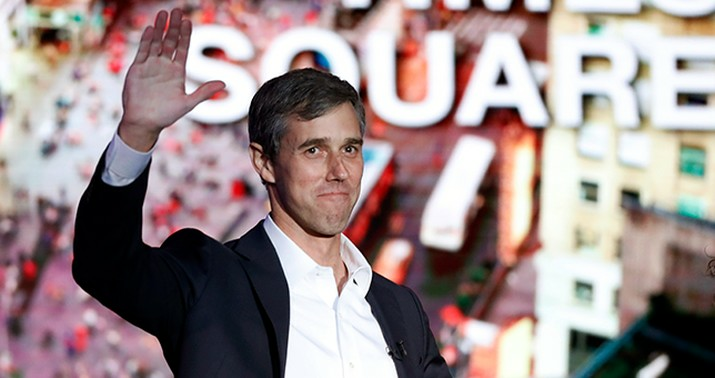 Yeah, fine, O’Rourke’s a left-winger *today. * What was he yesterday? What will he be tomorrow? At least you know where you stand with Bernie Sanders. Is President Beto really going to do the hard work of twisting arms in Congress on behalf of Medicare for All or will he endorse some lukewarm version of a public option for ObamaCare and call it a day? Why would lefties trust the guy who was preaching about generational theft in the context of spending cuts seven years ago to go big on socialism when given the opportunity? Harris is the big gainer in the poll, up eight points, but double digits is better than what O’Rourke has done in other polls and 20 percent isn’t a great figure for Sanders (although it’s a six-point gain since CNN’s December survey). Right now Bernie’s favorable rating among all adults is just 46/43, down from 51/35 in December. Being the socialist in the Democratic primary isn’t all upside, despite all the hype about the party’s leftward drift. If Democratic voters become convinced that Bernie’s a liability in the general election — and it sounds here like that narrative is already taking hold — then even some Sanders-friendly primary voters will look elsewhere. Although probably not to the guy who was ready to start playing around with Social Security during his first congressional run seven years ago. Here he is doing a little light pandering on the trail today.